Canon just made big news by going small: The new 5000-lumen Canon Realis 4K5020Z and the 6000-lumen Canon Realis 4K6020Z projectors are billed as the most compact and lightest native 4K laser projectors available. Designed for large venues and applications such as museums, art gallieres, education, and medical, both projectors support seven interchangeable lenses, including the new RS-SL07RST 4K Standard zoom lens (more information below). Priced at $43,499, the 5020Z measures in at just 18.8" x 7.7" x 21.4" (WHD) and weighs only 41.8 pounds. Its laser illumination system is rated for 20,000 hours of operation in Standard mode and 40,000 hours in Long Duration mode. The 6050Z has identical dimensions, weight, and illumination life specifications and is priced at $45,799. Both projectors carry a five-year or 12,000-hour usage warranty for normal usage. The Canon 5020Z and 6020Z projectors offer a unique built-in mid-life calibration system. Though not mandatory, a Gamma Restore function can be used to measure and adjust the LCOS panel luminance, while Light source Calibration can correct any age-related shifts in laser hue. Another unusual feature is the omnidirectional projection capability which allows projection in any direction, even vertically. For networking and remote control, the 5020Z and 6020Z are compatible with a variety of interfaces including Crestron RoomView, Extron XTP, and AMX Device Discovery. For installations that require a long cable run, the projectors' integrated HDBaseT receiver ensures a strong signal and stable image. Canon's warranty is a lengthy five years as long as the projector is not subjected to extended usage (more than than 60 hours per week reduces the warranty period to one year). 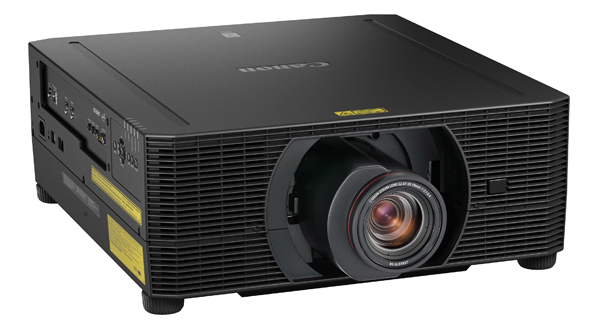 If a projector fails during its warranty period, Canon offers either a loaner unit while repairs are made or an exchange unit if the projector is eligible. 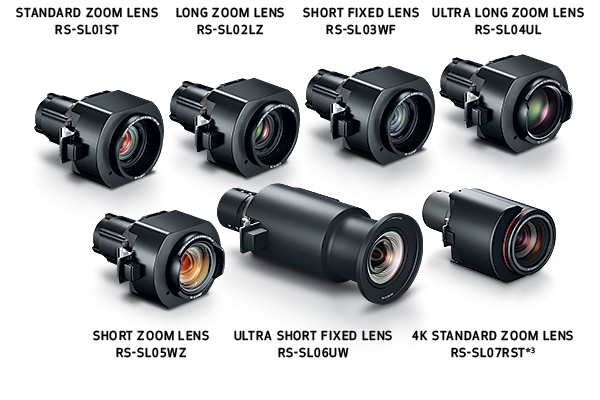 The new RS-SL07RST 4K Standard zoom lens joins six other specialty Canon lenses that use the same quick-change spigot mount system and together offer tremendous placement flexibility and functionality for the new projectors, including additional short and long zoom lenses and an ultra-short throw fixed-lens option. The RS-SL07RST distinguishes itself among the group by carrying Canon's "Red Line" seal reserved only for the company's highest quality lenses. Its ultra-low dispersion glass retains high resolution with reduced color shift and minimal color bleeding. The len's Marginal Focus feature accommodates curved surface projection. Priced at $8,000, the RS-SL07RST lens has a throw ratio of 1.34-2.35:1, and features vertical and horizontal image shift of ±73° and ±11°, respectively, to expand placement options.